President Vladimir Putin believes that Russia should meet the leadership of Ukraine half way on the issue of humanitarian aid to people in the zone of the armed conflict. "We agreed that we will implement the plan of helping people in Lugansk and Donetsk proposed by [Ukrainian] President Petro Poroshenko and take the way he suggested - we will be sending the food and goods by rail," Putin said on Voskresnoye Vremya (Sunday Time) show. He said it was Poroshenko's suggestion and he agreed with it. "We talked about that with President Poroshenko, too. He showed understanding for what Russia is doing. I believe that we also should meet the leadership of Ukraine half way on this matter," Putin said. 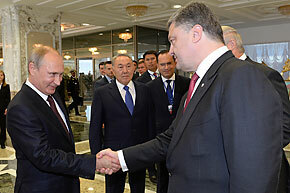 Putin also urged Kiev to begin negotiations on the political organization in the southeast of Ukraine. "We need to immediately begin substantive, meaningful negotiations, and not on technical issues but on the political organization of society and the state in the southeast of Ukraine in order to unconditionally ensure legal interests of people who live there," he said. Putin's spokesman Dmitry Peskov later called this interpretation incorrect. “Putin calls for beginning of inter-Ukrainian dialogue. Question of giving Novorossia status of separate state not raised,” said Peskov.